At CES Showstoppers 2018 BrainTap Technologies introduced the BrainTap Pro app, enabling consumers to quickly recharge their brains and bodies. 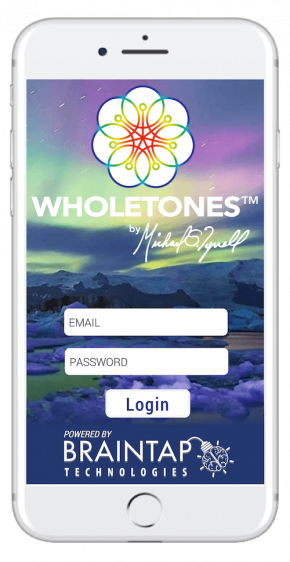 With technology previously only available from health professionals, this app will show you how easy it can be to relieve the effects of modern stress while rebooting busy brains for peak performance. Avg. user listens 28 times a month. It's that good! 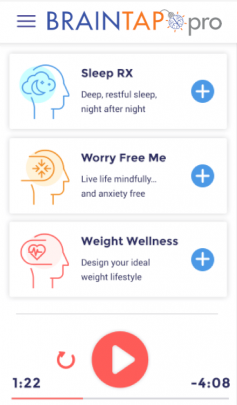 BrainTap is the first of the next generation of relaxation and mindfulness apps, taking the user through meditative brainwave states without the user having to actively participate. Traditional meditation or mindfulness apps would take years to achieve what can be accomplished with a few 20-minute BrainTap sessions, and the benefits are long-lasting. Can the BrainTap Pro app really do so much? Yes! Just grab your headphones, phone, a comfy spot, and it's easy as 1-2-3! Listen to Dr. Hoffman share what BrainTap has done for him and his family! Ruth shares a busy mothers perspective on what she gets from BrainTapping! Don't worry! It's not brain science... well, maybe a little. Your brain is electric, it has frequencies. Today doctors can measure the brain's electrical activity to identify what frequency or state your mind is in. Ever feel sluggish when you need to be wide awake or wide awake when you're trying to sleep? That's because, regardless of how you WANT to feel, what you WILL feel is determined by your brain's dominant frequency. Fact: Your brainwave frequency determines your state of mind. BrainTap gently guides your brain to the frequency you want! In short our brains LOVE patterns! Our exclusive NeuroEncoding process embeds tones and other patterns that emulate brainwave frequencies. Once your brain recognizes the pattern it will follow it, gently taking you to an extraordinary level of relaxation, creativity, focus, and performance that would otherwise take years of practice to achieve. So even if you don't experience profound effects during your first session, it won't take long for you to enjoy lasting positive changes in your mood and behavior. Why does BrainTap work so well? *Neither Ruth nor Dr. Hoffman were paid for their testimonial, but note: Dr. Hoffman uses BrainTap in his practice as a licensee. "I had terrific results in just 20 minutes!" Can you experience deep relaxation your first session? Yes, many people get results the very first time! Every brain and body is different, some people experience deep profound relaxation on their very first session. For others, it may take a few sessions before their brains recognize the patterns and creates the mindset their looking for. "I feel really relaxed, a really nice feeling!" *Neither Judy nor Wayne were compensated for their testimonial, nor are they BrainTap licensees or affiliates. Over 3 Million books sold worldwide in 4 languages, Including Awaken the Genius, Mind Technology for the 21st Century, which was awarded “Best How-To Book of 1994” by the North American Book Dealers Exchange. Head of mind-based studies at the International Quantum University of Integrative Medicine (IQUIM). Start my 30 day free trial! Sign-up today for this exclusive offer for the press and their close friends to enjoy 30 days, free!